Many Armenians say Pope Francis will be widely welcomed when he visits the country in June, thanks in part to a remark he made about genocide more than a year ago. In separate interviews, people of the landlocked, mountainous country in Eurasia said many Armenians view the pontiff favorably as well for his moral stance on pressing world issues and for his elevation of an Armenian monk to the rank of doctor of the church. "It is an invitation from everybody," said Mekhitarist Father Serop Tchamourlian, when asked about Pope Francis' upcoming visit. Father Serop projected that "the whole population" would come out to greet the pope during his trip here. The Vatican has said the June 24-26 trip is in response to an invitation from the patriarch of the Armenian Apostolic Church, Catholicos Karekin II, and from Armenia's government. Father Serop and others in the Armenian capital, Yerevan, told Catholic News Service that they felt the pope's use of the term genocide in referring to their history was a boost to long-term disputes with neighboring Turkey, over what they said had been a concentrated attempt to wipe out Armenians from territories under Ottoman control in 1915-18. The priest said he was planning to attend as many of the events scheduled for the pope's visit as possible, along with the 32 young men ages 14-17 whom he oversees at Yerevan's only Catholic seminary for minors. "It was all just a real big message of justice and truth, to accept something happened," he said of the April 2015 remark Pope Francis made in St. Peter's Basilica to a gathering of Armenian Christians, including Armenian President Serzh Sargsyan. In that address, Pope Francis lamented the forced expulsions and killings of Christians in the world and said atrocities from the past had to be recognized—not hidden or denied—for true reconciliation and healing to come to the world. The pope quoted from a joint declaration signed in 2001 by Catholicos Karekin and St. John Paul II, saying that what had happened to the Armenians was generally considered "the first genocide of the 20th century." Most historians estimate that anywhere from 800,000 to 1.5 million Armenians perished during those years, but Turkey contests such estimates and rejects accusations of genocide. The Turkish government withdrew its ambassador to the Holy See over the pope's 2015 remark, but returned him in February, following a Vatican communique that termed the 1915-18 events "tragic," but made no reference to genocide. Pope Francis is "very, very popular in Armenia," said Nvard Manasian, who works as a communications expert for a development organization and teaches at Yerevan State University. She said Armenians were looking forward to the pope's visit and that local media had been talking about it for weeks. Manasian said she, too, appreciated the pope's April 2015 remark about the genocide; her paternal grandmother was the sole survivor of massacres perpetrated by Ottomans a century ago in what is now Turkey, she said. It was the pope's active and compassionate position on such difficult issues—including refugees, poverty and global warming—that endeared him to her in particular, and to millions of others in general, regardless of denomination, said Manasian who, like more than 90 percent of Armenians is a member of the Armenian Apostolic Church. "On so many issues," she said, Pope Francis is "literally carrying the message of Christ through everyday life in whatever role he has assumed." "We have our catholicos, but ... I still would listen to what (Pope Francis) has to say, because he says it through experience, it's true, it's lived ... it actually resonates," she said. Following in the footsteps of St. John Paul, Pope Francis will spend much of his time in the country as the guest of the majority Armenian Apostolic Church and will attend a divine liturgy celebrated by Catholicos Karekin. Pope Francis, like St. John Paul, also is scheduled to visit the Tsitsernakaberd Memorial, a monument to the estimated 1.5 million Armenians killed by Ottoman Turks in 1915-18. Independent researcher, writer and Armenian Catholic Nareg Seferian said that, in addition to the pope's widely publicized and "moving" remark about the genocide, Armenians also greatly appreciated Pope Francis' decision last year to designate a 10th-century Armenian monk, St. Gregory of Narek, a doctor of the church. St. Gregory's "Book of Prayers," also known as "Book of Lamentations," is considered by Armenians to be among the most important pieces of Armenian literature, Seferian said, describing it as "a mystical prayer book," only "second to the Bible as a holy work." 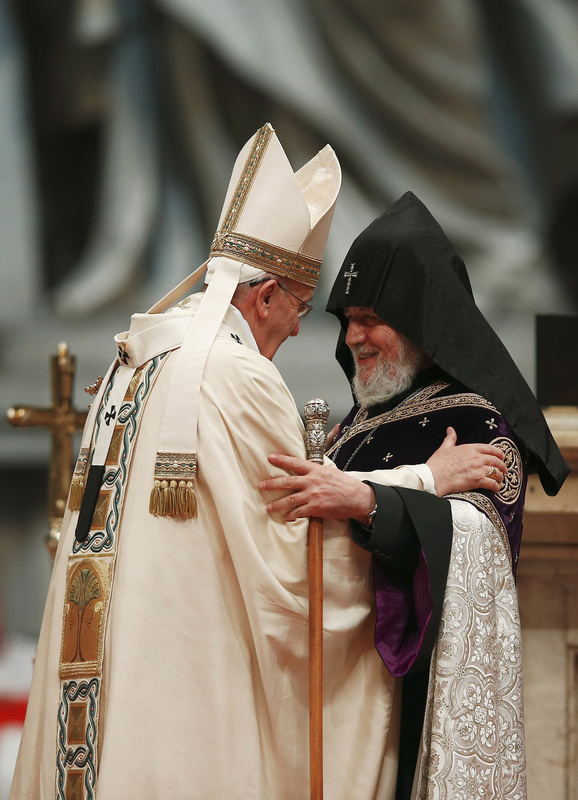 "I think it's fair to say that most Armenians are big fans of Pope Francis at this point," said Seferian, noting that his first name—Nareg—was the Armenian word commonly used to refer to St. Gregory's famous book. Father Serop said St. John Paul's visit increased understanding between the nation's Orthodox majority and its minority Catholics. He said he thought Pope Francis's visit would have similar effects. "I was here when Pope John Paul II visited Armenia in 2001 for the 1,700th anniversary of Christianity of Armenia, and after the visit I can tell that many things changed ... the personal relation changed in the thinking of the people," said Father Serop. "I am sure that with prayer and with this kind dialogue we will arrive at the unity desired by Jesus," he said.